A diverse group of rural New Zealanders has been chosen as the latest crop of Nuffield Scholars. Nuffield New Zealand and Primary Industries Minister Nathan Guy have announced the scholarships at a function in Wellington for West Coast dairy farmer Bede O’Connor; Woodville dairy farmer Ben Allomes; Rotorua-based DairyNZ regional leader Sharon Morrell; Whanganui farmer, entrepreneur and conservationist Dan Steele and Fonterra employee Satwant Singh from Morrinsville. 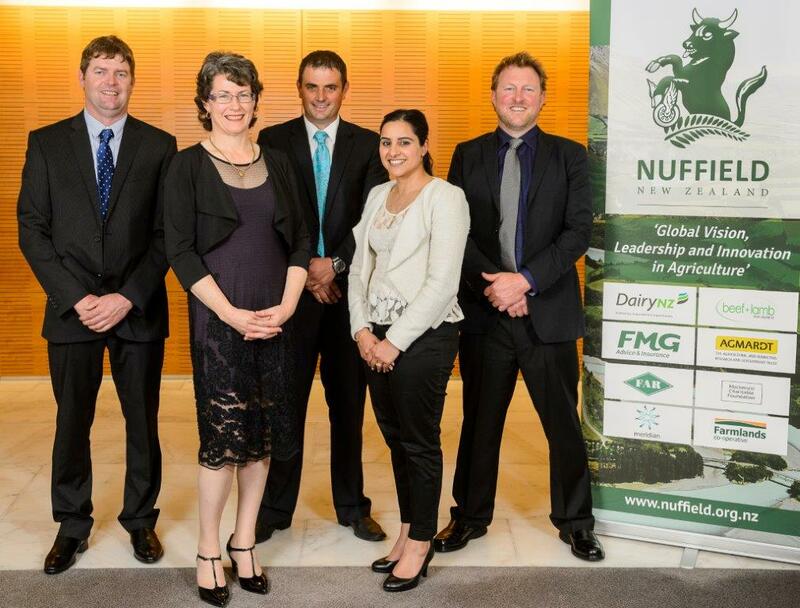 2015 Nuffield NZ Scholars – from left: Bede O’Connor, Sharon Morrell, Ben Allomes, Satwant Singh and Dan Steele. Photo credit: Mark Coote. The five new Scholars join more than 145 others who have been awarded Nuffield Scholarships in the past 60 years, which has been a substantial investment in New Zealand agriculture’s past, current and future leaders, says Nuffield NZ chairman Julian Raine. The Nuffield NZ Scholarship offers the opportunity for overseas travel, study of the latest developments in a number of leading agricultural countries and provides an introduction to leaders and decision makers not accessible to the ordinary traveller. One of the current 2014 Scholars is Palmerston North potato grower, agricultural contractor and equity dairy farmer Paul Olsen. Olsen says the Nuffield name opened many doors. He says the contacts made and networks formed will last a lifetime. Nuffield Scholars travel internationally for at least four months in their Scholarship year (not necessarily consecutively), participate in a Contemporary Scholars conference with 60 Nuffield Scholars from around the world and attend a six-week Global Focus Programme with an organised itinerary through several countries with other scholars. They also have their own individual study programme with a research report due at the end of their travels. The 2015 research topics are likely to cover issues such as the internal growth potential of China; recognising and utilising New Zealand’s greatest asset – its people; farming communities’ responses to changes in environmental regulations or other constraints; the potential of “Brand New Zealand” and how having communities involved in conservation will show value in looking after the environment; and farmer understanding of their financial and overall business health focusing around budgeting, risk management, stress levels for farmers, suicide levels and farming pressure.